New Chapter 11 Filing - Claire's Stores Inc.
Claire’s® Stores Inc. is the latest in a string of specialty "treasure hunt"-styled retailers to find its way into bankruptcy court. In this case, the debtors, together with their 33 non-debtor affiliates, sell jewelry, accessories, and beauty products to young women/teen/tweens/kids; it has a presence in 45 nations spread throughout 7,500 company-owned stores, concession stands, and franchises. The company proudly states that "[a] Claire's store is located in approximately 99% of major shopping malls through the United States." Moreover, "[e]ach of the Debtors' store locations are leased, and are typically located in traditional shopping malls with, on average, 1,000 square foot of selling space." PETITION NOTE: this explains a lot. Hashtag, retail apocalypse. First Day Declarations are interesting in that they are the first opportunity for a debtor-company to tell its story to the public, to parties in interest, and, significantly, to the bankruptcy judge. And this declaration is particularly interesting because, unlike many of its bankrupt specialty retail predecessors, Claire’s® makes a concerted effort to delineate why its physical presence is so critical. So what is that critical piece? Apparently, it is ear piercing. Yup, you read that right. Ok, well that and the "treasure hunt" shopping atmosphere which "simply cannot be replicated online." The company boasts about solid operating margins. and notes that, at the time of filing, it only intends to shed 95 leases. The company notes that it has established trust with parents and the number of pierced ears is indicative of that; it estimates that it has pierced over 100 million ears worldwide (since 1978) and 3.5 million in fiscal year 2017. While that is gimmicky and cute, the company doesn't not note how much of the reported $212 million of EBITDA (on $1.3 billion of revenue) is related to this phenomenon. 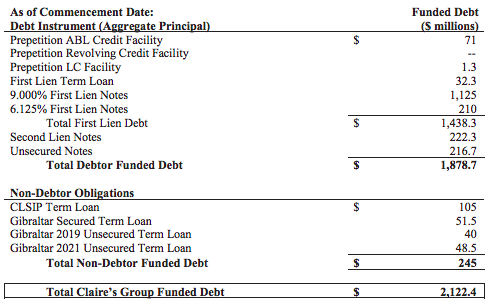 Moreover, all of the trust in the world cannot overcome a capital structure with $1.9 billion of funded debt (ex-$245 million more at the non-debtor affiliate level) and $162 million in cash interest expense (see chart below) - especially when $1.4 billion of that funded debt matures in Q1 '19. And particularly when fewer and fewer people tend to frequent the malls that Claire’s® dominate. Notably, the company says ONLY the following about e-commerce: "Finally, the Claire's Group operates a digital sales platform through which new and existing customers can purchase products directly through the Claire’s® and Icing® websites and mobile application." So, as the malls go, Claire’s® goes. Notably, the company makes a point that it "is growing, not shrinking, its business. The Company expects its concessions business to grow by more than 4,000 stores in 2018." Landlords take note: the company highlights its CONCESSIONS BUSINESS, which is essentially a "mini-footpring" utilizing the store-within-a-store model. In other words, this growth won't help the landlords much. In addition to its debt, the company notes - as a primary cause for its bankruptcy filing - that the "Debtors operate in a highly competitive market." PETITION NOTE: No effing sh*t. Mall traffic has declined 8% year-over-year and the debtors - ear-piercing demand notwithstanding - aren't impervious to this. Accordingly, revenue is down $200mm since 2014. To counteract these trends, the company engaged in exchange transactions back in 2016 that had the effect of stripping out intellectual property collateral, swapping out debt, and deleveraging the company by $400 million. Clearly that was a band-aid rather than a solution. Now the company purports to have a restructuring support agreement with the Ad Hoc First Lien Group which, in addition to 72% of the first lien debt, holds 8% of the second lien notes and 83% of the unsecured notes. The members of the Ad Hoc Group of First Lien Creditors have agreed to provide the Company with approximately $575 million of new capital, including financing commitments for a new $75 million asset-based lending facility, a new $250 million first lien term loan, and $250 million as a preferred equity investment. In addition, the company has lined up a Citibank-provided DIP credit facility of $75 million ABL (supported, seemingly, by the consenting ad hoc first lien group) and a $60 million "last out" term loan. Consequently, Claire's expects to complete the chapter 11 process in September 2018, emerge with over $150 million of liquidity, and reduce its overall indebtedness by approximately $1.9 billion. We'll believe it when we see it. Financial Advisor: Millstein & Co.
First Lien Note Agent: The Bank of New York Mellon Trust Company N.A.